Not all of Sylvester Stallone’s projects involve reuniting as many action heroes as possible for sequels that up the ante on explosions and bullets. He’s also got a side as soft as punch-tenderized beef, particularly when he talks about the musical adaptation of the film that defined him, Rocky. The musical debuted in Germany last October, and will make its Broadway debut in early 2014. Alex Timbers, who garnered Tony nominations for plays (Peter And The Starcatcher) and musicals (Bloody Blood Andrew Jackson) will direct, with music and lyrics from Stephen Flaherty and Lynn Ahrens, the writing team behind Seussical. 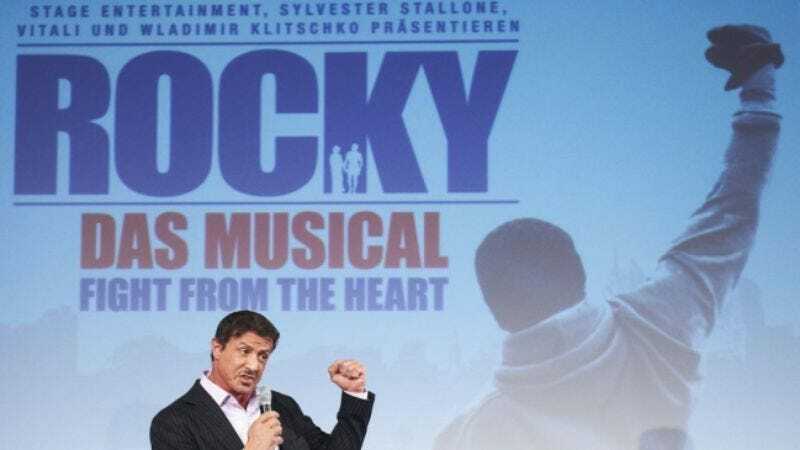 If Rocky takes off, it could open the door for more lucrative boxing musical adaptations. All Raging Bull needed was a few songs from Joe Pesci to really become a classic, and Russell Crowe returning for a Cinderella Man musical could run for decades.